jdub69 asked the Answer Line forum for the best way to move Web browser favorites (also known as bookmarks or shortcuts) from one computer to another. This depends on which browser you're using. I'll give directions for the current versions of Internet Explorer, Firefox, and Chrome. This is a simple matter of moving the contents of your Favorites folder from one computer to another. It's best to do this with IE closed. 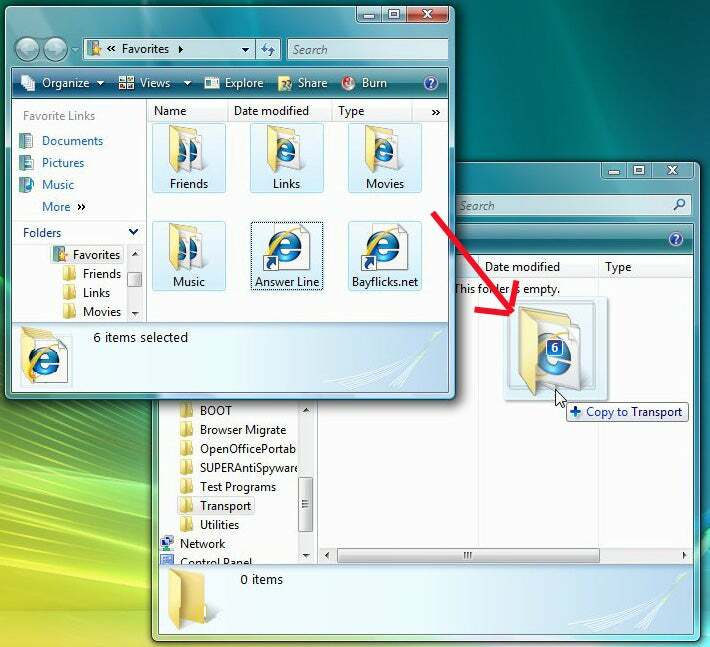 In the old computer, create a new folder, either inside a shared folder (one that can be accessed by other computers on the network), or on an external drive (such as a flash drive). I'll call that folder Transport, although you can give it another name. Open the Transport folder. Next, select Start (Start, then Run in XP), type favorites, then press ENTER. This opens your Favorites folder. Press CTRL-A to select everything in it, and drag it all to the Transport folder. If you're asked if you want to do something, you do. On the new computer, open the Transport folder (which will require you to either access the network or plug in the external drive). Then open the Favorites folder as described above. Drag everything from Transport to Favorites. window, select Import and Backup, then Export HTML. Save the file to a shared folder or an external drive (such as a flash drive). On the new computer, gain access to the HTML file you just created by logging onto the network or plugging in the external drive. Then, in Firefox, once again select Bookmarks, then Organize Bookmarks. Select Import HTML and follow the wizard. and select Bookmark manager. Once in the Bookmarks Manager, select Tools, then Export bookmarks. Save the file to a shared folder or an external drive (such as a flash drive). On the new computer, gain access to the HTML file you just created by logging onto the network or plugging in the external drive. Click the Tools icon and select Bookmark manager. Once there, select Tools, then Import bookmarks. It's all pretty obvious from there.